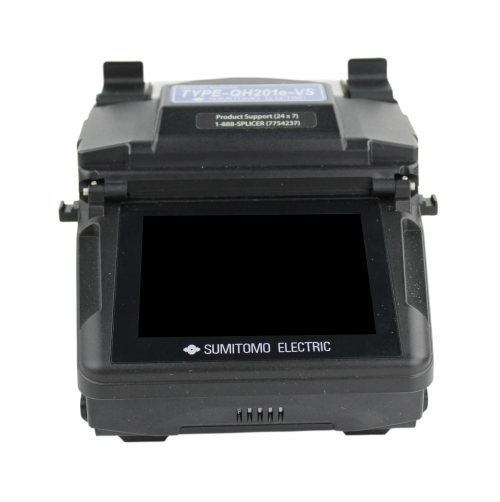 Sumitomo Electric Lightwave’s Quantum Type-QH201e-VS marks the new standard for FTTx/Handheld fusion splicers. This amazing handheld splicer boasts the industry’s smallest footprint and fastest typical splice time. It is also the first and ONLY to incorporate a fully navigational color touch screen interface for maximum user friendliness; on-board training videos; remote software updates; and USB 24-7 remote maintenance capability. Other features include li-ion battery technology and an easy to use fiber holder system — with the legendary reliability common to all Sumitomo Electric splicers. The Quantum Type-QH201e-VS is by far the most advanced FTTx/Handheld fusion splicer in the industry, yet it’s also rugged with superior dust, shock and water-proof resistance, making it the ideal choice for even the harshest environments. Sumitomo Electric Lightwave’s Quantum Type-QH201e-VS marks the new standard for FTTx/Handheld fusion splicers. This amazing handheld splicer boasts the industry’s smallest footprint and fastest typical splice time. It is also the first and ONLY to incorporate a fully navigational color touch screen interface for maximum user friendliness; on-board training videos; remote software updates; and USB 24-7 remote maintenance capability. Other features include li-ion battery technology and an easy to use fiber holder system — with the legendary reliability common to all Sumitomo Electric splicers. The Quantum Type-QH201e-VS is by far the most advanced FTTx/Handheld fusion splicer in the industry, yet it’s also rugged with superior dust, shock and water-proof resistance, making it the ideal choice for even the harshest environments.